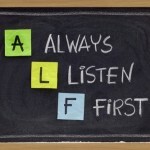 There are three things that most customers must do before they will buy your service or product. They need to know you, like you and trust you. Many customers will know your business from other people, your advertising or your website. That means you can focus on getting them to like and trust you. Most people like people who listen to them. Years ago, I was struggling in a new sales role and asked the top salesperson for help. He told me: “You talk too much – customers will tell you how they want to buy from you if you learn to listen”. So to get your customer to like you, let them talk. Ask some leading questions (these have to be open questions – ones which begin who, how, what why or when). They will then tell you the problem they need solving. They will appreciate that you are listening to them and that you care about their problem. It shows you are willing to try and help rather than just interested in trying to sell your product. When they have explained the problem, start to build trust by confirming your understanding. Summarise what they have told you and show some empathy. It’s important to make it clear you understand how it could affect them. You then create even more trust by recommending a solution (your product or service). Don’t go into a typical sales spiel about how wonderful it is, listing 101 unique features. Instead, explain how it solves the sort of problem they have, and explain the benefits to them. For example, I recently spent an hour with a potential client. They wanted to improve their lead to sale conversion rate. It became clear that they also need to improve customer retention, but they didn’t see that as important. If I had explained how I could improve lead conversion, customer loyalty, and referrals, I would have lost the customer at that point. They would have thought it was too big a solution for them and that they would be paying for some parts that they wouldn’t use. Instead, I just talked about using it to increase conversions. We got the contract. Because it was just to look at one element of the customer journey, we charged a low price. But, when we had done the work, I introduced the idea of using journey mapping to help with customer retention. Guess who called me a week later to arrange some more work? And that brings me to my final point. 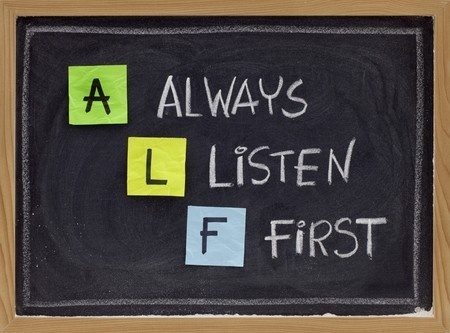 Part of listening first and talking second is that you need to keep doing it. By that I mean, if you have explained the benefits of your product or service and you’re not yet getting buying signals, ask more questions. Make sure you listen to find out what objections they could have. Often this will help you close the sale. Often you will need to give them some thinking time. If you do, make sure you follow up. It’s amazing how many sales opportunities are lost because of no follow up. Any proposal or sales meeting should be followed up within days. Don’t look for an answer though, just ask if there is any more information you can provide. People get busy and distracted so you need to remind them to keep them on track. If they don’t want to proceed, it’s better for you to know early to free up time to contact other likely prospects.